Cherish days gone by with this grown-up version of one of childhood's greatest gadgets. Ah, nostalgia. Give yourself a double dose with this grown-up, just-for-you version of one of childhood's greatest gadgets: the reel viewer. Assemble snapshots of your favorite memories and add them to your very own reel using the redemption code included with your viewer. Once you receive your made-to-order reel, pop it in the viewer and marvel at baby's first steps, or your favorite beach at sunset, or... well, whatever else you want immortalized. 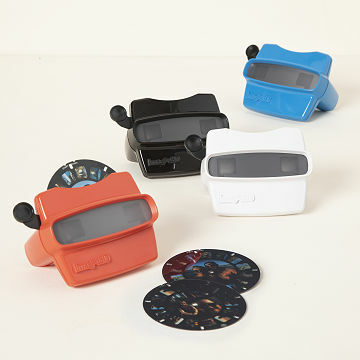 Remember: You're the view master now. Made in Oregon. Viewer Set includes code in package to redeem one reel of 7 images. Finished reel shipped within 5 business days of photo submission. Transit time is additional. International customers may incur additional shipping fees when they redeem their reel. I can't comment on the item as it was a gift. However I thought everything was included. I was very disappointed when my relative had to pay for postage. Not cool. This will be a perfect reminder of the journey my son has already traveled in life to prepare him for his life ahead. I will be buying more disks with relavent pictures on them. Going through pld photos, and gathering eight for each family member. Then gift them all at once after Christmas dinner. Purchased this so when my Grandaughter comes over she can have the same fun I had as a child but now with her pictures. It's a hit will every age! The first child one received his Reel Viewer and everyone wanted to look at the pictures, young and old alike. Your reel redemption code is included on a labeled card inside the product box with the viewer and not sent via email. Have fun choosing your favorite memories!